Sometimes you run across a cookbook that you keep for life. The cookbook that I have was passed on to me by my mom. My father rebuilt a 1960's Pontiac GTO and used to take it to car shows. He did rather well with the car and won mostly first place ribbons. He was so proud of that car. Well, getting back to my cookbook story. This cookbook was put out by the Badger State Chapter of the Pontiac-Oakland club. There are several recipes from this book that are old stand-by's. I hope you enjoy this cake as much as I do. 1. Mix flour, soda, cinnamon and salt. Set aside. 2. Beat oil and sugar together until thick. 3. Add eggs, one at a time, beating after each egg. 4. Add remaining ingredients together and mix. 5. Bake at 350 degrees in a greased round baking pans lined with waxed paper for 30-35 min or until a toothpick inserted in the center comes out clean. 6. Cool 5-10 minutes, remove from pans and cool completely. 7. Frost with cream cheese frosting recipe below. 1. Let cream cheese and margarine warm to room temperature; then cream thoroughly. 3. Gradually beat in sugar. 4. For good spreading consistency, frosting can be thickened by adding more powdered sugar or thinned with heavy cream. We were able to go up to our cabin in northern Wisconsin over the Thanksgiving holiday. My mom drove up from Illinois. Luckily, we had 3 inches of fresh, white snow. It was very beautiful. We had a great Thanksgiving meal and it is amazing the things you can do in a limited kitchen. Although, as you may guess, we have more up there than most people who have north woods cabins do. The menu consisted of a brined roast turkey prepared using a method I heard about from Martha Stewart. The turkey is covered in cheesecloth soaked in butter and white wine, then basted with the mixture every 30 minutes. This method makes the juiciest turkey you will ever have. We also had red peppers stuffed with mashed cheddar potatoes and then baked. There was roasted yellow squash along with a Brussells Sprouts gratin. I found a recipe for stuffing made with, of all things, White Castle hamburgers. Those who are familar with White Castle's will understand. Very interesting! I have attached photos of the Thanksgiving meal. So, stay tuned this week for all the great recipes from this holiday! I hope you all had a great holiday as well. On Sunday, we had blue cheese burgers (Bluecy's). I thought the sweet/sour corn relish would be a nice compliment to the salty taste of the blue cheese. I did have to add a bit more sugar to the recipe. I have adjusted the amount below. 1. Combine vinegar and sugar in saucepan over medium heat until simmer. Add the hot sauce, celery seed, mustard seed, salt, corn, red pepper, onion and mustard powder. 2. In small bowl whisk corn starch into cold water. Add to the corn relish mixture and bring to boil. Once the relish thickens, remove from heat. Refrigerate for at least one hour. You would never think that cooking pasta would be difficult for some people. It's just boiling water and dropping in the pasta! There are some people to struggle with under/overdone, sticky, or tasteless pasta. 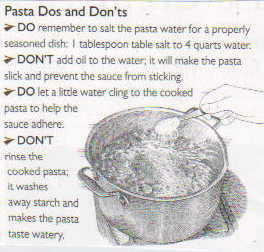 Here are some tips for making the perfect pasta for your dinner! Never Thought It Would Be So Good! During the past week, I noticed this blog has hit the 3,000 mark. I thought it would be a good time to express my thanks to all those who follow this blog. When I began it last December, I simply thought it would just be a way to convey some of my favorite recipes, tricks, and stories to my family and friends. It was to be an outlet for a passion I have had for many years. Who would have ever guessed this small little blog would go WORLDWIDE. The internet is a great thing. Allowing us to share information with people that would normally never see it because of logistics. Periodically, I review the statistics for the visits. Services that track website usage are there to allow the owners of sites to monitor where visitors are from, the day and time they visit, and how long they stay on the site. I thought since the site has gone worldwide, I would share some of the places that visitors have clicked in from. Who would have every thought a guy who moved from Chicago to a small town in Wisconsin would have so many international visitors. The list below is just a portion of the countries. At this point, I would like to thank all of those people who have been regular visitors and those that have referred my blog to their friends and family. You all have made writing this blog worthwhile. I have a renewed energy and will be going back to regular daily postings. If I can help one person share my passion for food, I have done my job! My only request to you all, loyal viewers, is to pass along your comments and feedback. It is with this feedback that I can make this site better. If there is anything you would like to see or read about, feel free to drop me a line and I will be happy to do my best to help. I have heard from people that leaving comments can be a bit cumbersome if you do not have a gmail account. Without a gmail account, simply post the comment as Anonymous, you will not need to enter an email address. Then just end the comment with your first name. Thanks, again, to each and every one of you! I plan to continue bring you great recipes. And remember, I will never pass along a recipe that has not been tested and will include a picture for each and every dish. These bars are super easy to make and really taste quite good. The bars pictured were made with 1 cup of butterscotch chips. I also melted ¼ cup semi-sweet chocolate chips melted in the microwave at 10-second intervals until melted. 1. Combine all ingredients except chips. 2. Spread in a 13 x 9-inch pan, greased and floured. 3. Sprinkle chocolate chips over top. 4. Bake 25-30 minutes at 350° (will look bubbly and light in the center). This morning I woke up and had quite the craving for Chinese food. There are three things that I can not live without. Chinese, pizza, and hot dogs! So, when the urge for Chinese hit, I thought lets try something different. I ran across this recipe for Peanut Butter Pork. I would suggest adding the honey and chili paste to your taste at the end. 1. Cut pork into 1-inch pieces. Beat eggs and milk. Dip pork into egg mixture and then into bread crumb mixture. Brown pork chops in approximately 1-inch of vegetable oil; remove from pan to a plate lined with paper towel. 2. Put peanut butter and soup in pan and heat, adding water gradually; stir until smooth. Add garlic powder and chopped onion. Simmer 10 minutes, stirring constantly. 3. Add honey and chili paste to taste. 4. Reduce heat and simmer 5 minutes. There is nothing better than freshly baked muffins or bread when you have company. Your guests will soon be waking to he smell of raspberries and cinnamon in the air. This time I made these muffins in a loaf pan and the bread turned out great. The bread baked just under an hour. I used our frozen blush raspberries we picked this summer. 1. In a large bowl, combine the first six ingredients. Combine egg, milk and butter; stir into dry ingredients until just moistened. Fold in raspberries and lemon peel. Coat muffin cups with nonstick cooking spray or use paper liners; fill ¾ full with batter. 2. Combine topping ingredients; sprinkle about 1 tablespoon over each muffin. Bake at 350° for 18-22 minutes or until a toothpick comes out clean. Cool for 5 minutes before removing from pan to a wire rack. Combine glaze ingredients; drizzle over warm muffins. 3. If making this in loaf form, place batter in a greased pan and bake for 50-60 minute or until a toothpick in center comes out clean.